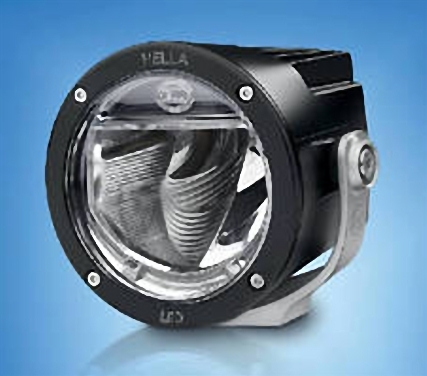 HELLA, Inc., the North American aftermarket branch company of automotive lights and electronics supplier HELLA, has just introduced their latest item to the Rallye 4000 Series – the HELLA Rallye 4000 X LED Driving Light. Using an innovative double reflector and high power LEDs, HELLA has created a compact lamp that provides powerful LED performance while using only 40W of power consumption. This remarkable LED driving light features two high performance LEDs in a highly styled double reflector design that clearly differentiates it from other halogen and Xenon (HID) lights. When switched on, the clear, cool white LED LED driving light provides distinctive lighting, by night and by day. Besides, HELLA highly efficient, free-form double reflector creates an even beam pattern and excellent long-range road lighting. The newest HELLA Rallye 4000 X LED Driving Light is suitable for 4WD four-wheel and off-road activities as well as heavy-duty transporter applications, plus any drivers interested in innovative LED technology. Being maintenance-free, the high-powered LEDs used in the LED driving lights will last for over 15,000 hours. The combination of rugged technology and extremely long-range beam makes this retrofit LED driving light an easy solution for the requirements of use in off-road and harsh conditions. The HELLA Rallye 4000 X LED Driving Light comes in a durable, water proof metal housing as a complete single lamp kit, which includes a mounting kit for an upright mount and step-by-step mounting instructions.